Gosh, is it Thursday already? I feel like we didn’t get as much accomplished as I had hoped this week. I’m not going to lie, I’m nervous. Hopefully, I’m not alone in this. Wondering what in the world I’m talking about? 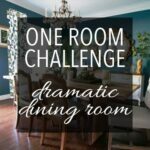 Two hundred or so bloggers and I are participating in a crazy bi-annual event called the One Room Challenge. Linda, our host blogger from Calling it Home invites us to choose one room and give it a makeover in just 6 short weeks! I wasn’t kidding when I said it doesn’t look too much different from last week. Click here for a recap of the design plan and previous weeks. Most of the delays we have encountered so far are because the plumber just arrived yesterday, Wednesday, to plumb out the shower. It’s times like these that make you are thankful for a master plumber so there aren’t any more delays when you need to get work done. Because we are going to build an angled bench in the outside corner along with adding a shower curb, I couldn’t finish this bit of tile work. It is nearly impossible to tell exactly where the floor tile will end and exactly where those two pieces will go at this point. Because we opened the shower up from above and the two sides, we reconfigured the way the faucets work, added an extra shower head and where they are located in the shower. It will be tiled in a brand new 12×12 porcelain marble tile from South Cypress. This is the most beautifully realistic looking marble I’ve ever seen. Click here to see wide range of sizes. The main, rain-shower head will be straight back, but the diverter, to turn on the shower is on the left. That way you can turn on the shower without actually being in the shower. The tile work is nearly complete sans this part and one closet, but I still have not grouted the main areas of the floor kind of because of this. Grouting goes pretty fast for me, so I feel like I can knock it out pretty quickly. I also worked on a little secret project for the bathroom. Full details next week! Although at times I came very close to finding a plumbing repair service, we stuck at it and now the challenge is nearly over! I’m not looking forward to the time when I need an electrician though, hopefully things will go a lot smoother. A friend recommended that I use someone like this Raleigh electrician, but I guess I just got to wait and see what happens. But in the scope of our whole house renovation, this week was huge for us. We actually have a window in the bathroom again!! For several weeks after we moved into #theTrailHouseReno we lived with just a piece of house wrap, Tyvek, covering the hole for the window. I am going to take a wild guess and assume you have never lived with a hole in your house like this before. Let me elaborate. No bugs or critters can get in, but you hear everything. Every cricket, every frog, every noise just as if you were camping in own your backyard! You can imagine the whole camping thing really wore on us. My resourceful husband, Richard, decided to solve the problem by insulating the window. This really helped with the noise and we could rest in peace and quiet again. We had no natural light and no cricket noises but it totally lacked the aesthetics a new window was supposed to provide. I’m not going to go into the unfortunate tale as to how and why all this happened but it revolved around the fact that I enlarged the opening and wanted the leaded glass removed. Here is a before photo as a reminder. We added an extra deep windowsill to hold an assortment of bath sundries and likely plants. The large soaker tub will be right in front of this window. You can see the rough in for the plumbing on the floor. Here’s where I’d love your opinion. All along, I have envisioned flowing curtains on each side of the window. I still haven’t actually ordered them, but likely they will be almost sheer, just enough to give some privacy when closed. Unlike this photo, the rod would extend past the window so the view will be unobstructed when open. But now I realize I have to choose. I can either have the curtains or the windowsill, but not both. The tub filler is right in front of the extended windowsill and the curtains will not fit with the sill. I would prefer not to add blinds or even shades here. I could do dummy panels, but I really do not want the extra layers of both. Wide open views from windows make me very happy especially now that I realized I actually have a nice view of the backyard. So tell me, What would you give up the drapery panels or the window sill storage? 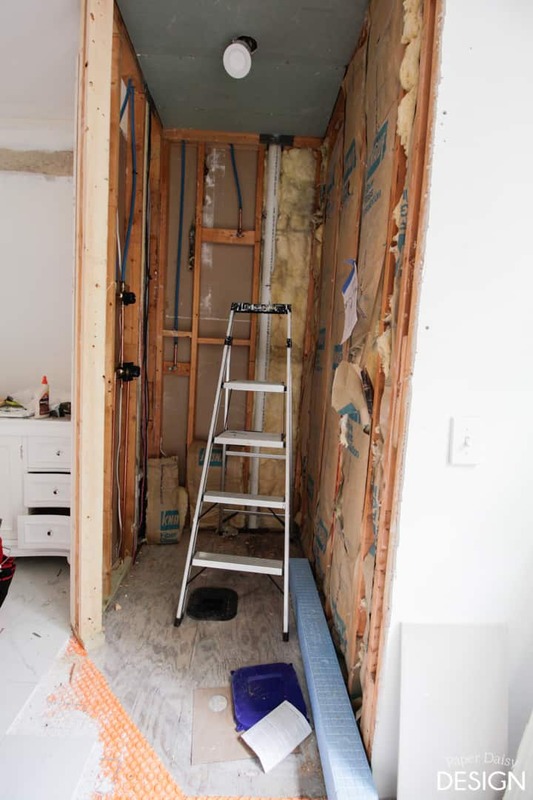 Tomorrow, we will frame out the shower and move forward with that big project. 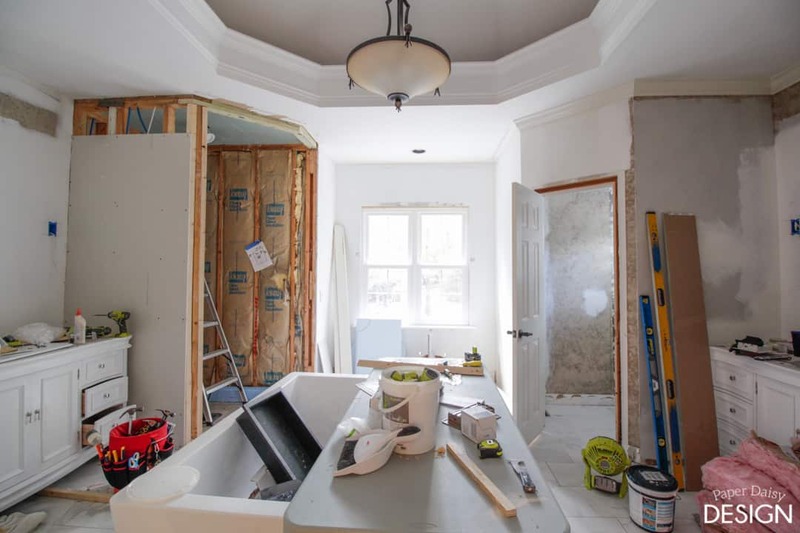 By next week’s update, the marble will be installed on top of the vanities. 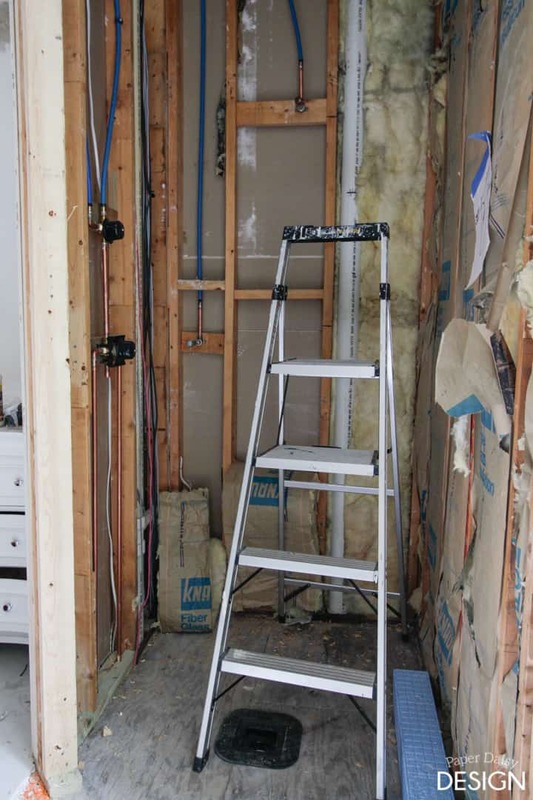 The plumber will come back and install the faucets, set the tub and drains and finish up all of the other plumbing work. I am hopeful we will feel like we have really turned a corner. One last thing. 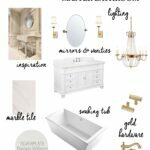 As promised last week, here is a look at my marble choices. Ultimately, I ended up choosing the one on the left. I think it will provide a slight contrast to the floors. The different variations of color definitely won me over too. Here’s a quick list of the projects still ahead. Build, waterproof and tile shower, including a small bench and large niche. 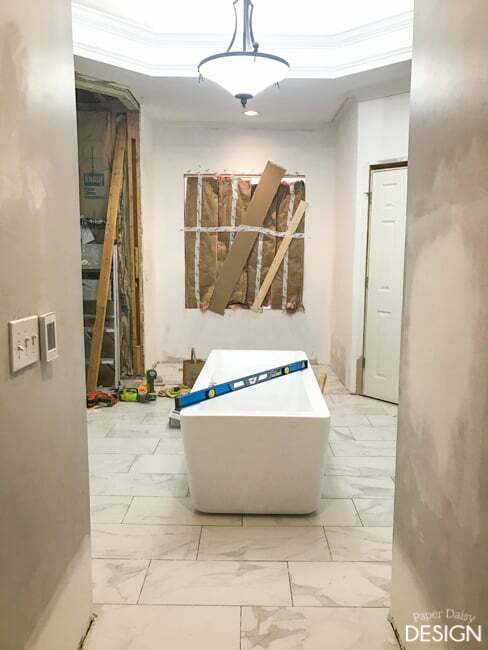 Plumbing, install the tub and faucets. Order and install glass shower wall and door. Have a company coming to measure next week. Install moldings and finishes around the room. Build and hang new doors. 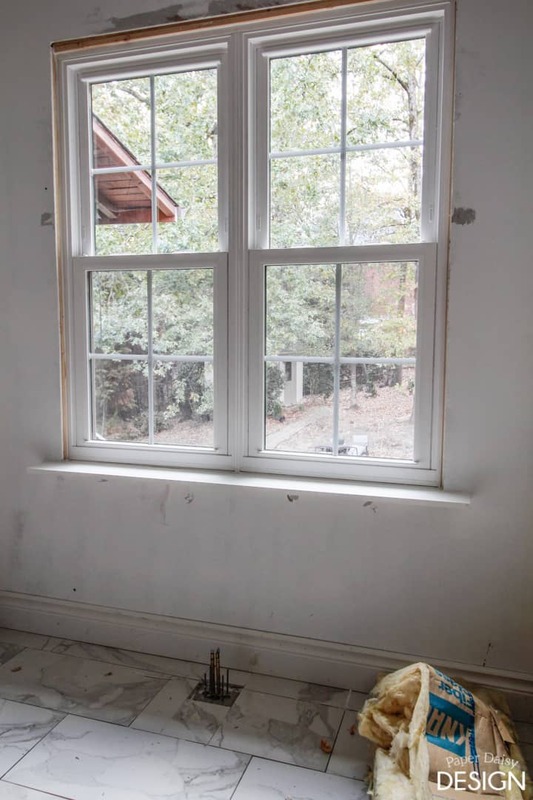 Expanded windowsill and window installation. 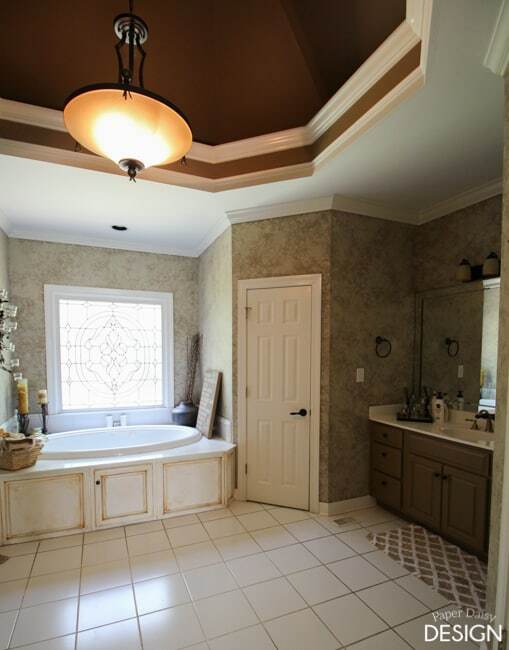 Find a rug for in front of the tub. Don’t forget! I would love some feedback on the curtain vs windowsill dilemma. And if you’re a fan of the windowsill what would you use? I am extremely grateful for the support of the two major contributors to this season’s One Room Challenge, Metrie & South Cypress. 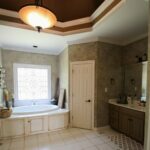 Want to see last year’s One Room Challenge, also a master bathroom Click here. The previous spring I completed a porch and patio. You can see those spaces here. « The Clean Way to Clean Dishes. 2. 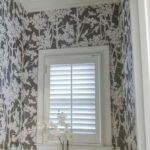 The window is your main focal point, the first thing you see when entering the bathroom, are you okay with seeing something silhouetted in front of your great view? 3. Are you okay with having tub storage elsewhere? Depending on what your needs are, you could put some minimal shelving on the wall to the right of the tub, use a small side table by the tub, or even a cool chair. This is coming along beautifully! I love the tile!! Unless I am missing something, why can’t you use a rod that projects out as far as the sill? It’s going to be gorgeous no matter what you do! Searching all over to find out what kind of tub filler this is? Please help…I love it! !